Hello! Marge Taylor here, and I am delighted to share a recent project with you! Like many artists, I’ve bought all sorts of supplies over the years, some of which got tucked away to languish on a shelf. I realized I had some things for years and recently made a resolution to try and use some of these supplies. 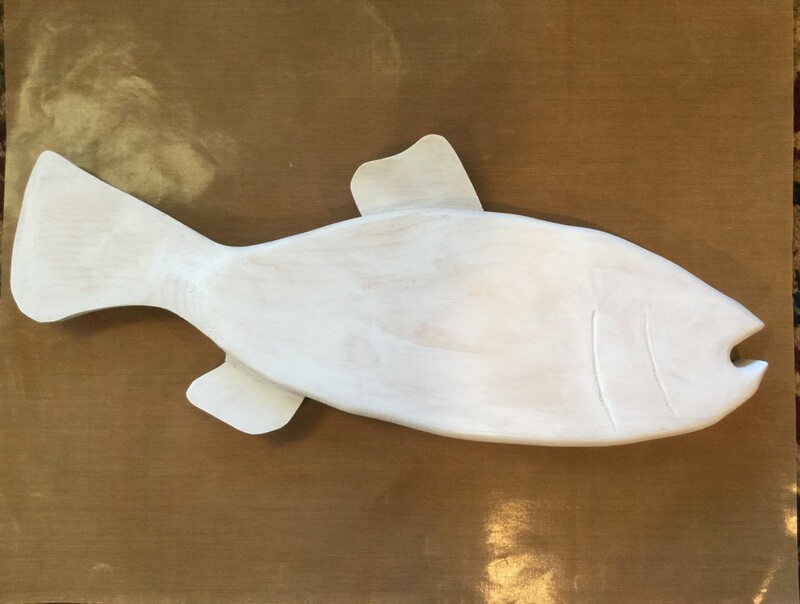 I had purchased the wooden fish years ago and don’t even recall my initial plan for it. After it resurfaced, I contemplated several possibilities. I also had supplies I had picked up over time with the vague idea of doing a steampunk project someday, so I decided to do a steampunk fish. I sanded any rough spots on the fish and applied a coat of primer and a coat of metallic paint. I wanted the fins to have texture, so I applied a thin coat of flexible modeling paste to the fins. I used a craft stick and a comb to etch out fin lines. I decided I wanted a raised panel on the fish back to contribute to the steampunk look, so I cut a strip of craft foam and glued it to the back. I painted the entire surface in a neutral metallic color. I washed a thin coat of green paint along the back and belly to give the fish some color. I sponged paint on the back panel in several grey tones to give an industrial look. I lined up the Circles Layer Me Stencil on the spine and painted a line of circles, then lined up and added the coordinating smaller circles. I put a line of paint dots along the edges using a paint brush handle. I glued a metallic bead in the center of each circle. This gave the look of bolts and rivets that steampunk requires. I shifted to the sides of the fish and used the Connected Eyes Layer Me Stencil to give the look of scales. I added some small circles from the Circles Layer Me stencil along the belly. I decided the Border Circles Stencil could be adapted to give the look of gears. I placed them along the back spine and stenciled them in. I added hand painted circles to them. I had a collection of gears I was able to glue to the sides. I used an adhesive called Liquid Fusion, which works on non-permeable surfaces. I used a combination of gears and a flat back bead for the eye. I hung the fish. I was happy that I was able to achieve a steampunk look with stencils that could be used in many other ways. I was also thrilled to finally use some supplies I had on hand. This was my first time using the flexible modeling paste, and I found it easy to use with excellent results. I will definitely use it again. Thanks for checking out my project! Come visit me!